Maddow fought back tears as she reported on her own collapsing narrative, to which Twitter user ‘Karli Bonne’ (@kbq2251) posted a video of herself laughing at Maddow’s despair. This entry was posted in 1984, Citizen News, CitizenWells, Lies, media, News, Orwellian and tagged Rachel Maddow crying? others in Fake News in despair over Mueller report?, Twitter bans users and James Woods rejoices. Bookmark the permalink. “It has been obvious from the very beginning that the Maddow Muppets were being sold a lie. In 2017 I wrote an article titled “How We Can Be Certain That Mueller Won’t Prove Trump-Russia Collusion”, saying that Mueller would continue finding evidence of corruption “since corruption is to DC insiders as water is to fish”, but he will not find evidence of collusion. If you care to take a scroll through the angry comments on that article, just on Medium alone, you will see a frozen snapshot of what the expectations were from mainstream liberals at the time. 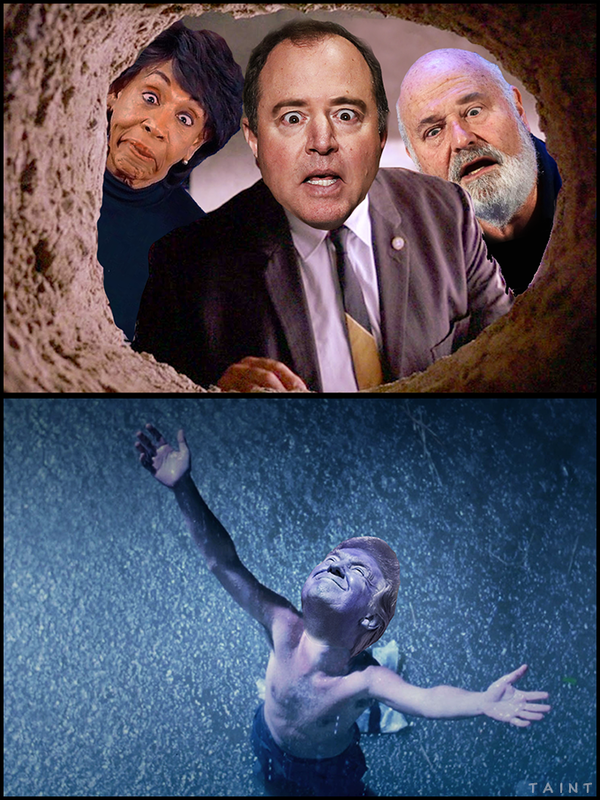 They had swallowed the Russiagate narrative hook, line and sinker, and they believed that the Mueller investigation was going to vindicate them. It did not. ……………LIBERAL MANIACS like Rachel Maddow, cannot accept reality………..her fantasy world is what it is, but it is now collapsing around her just as is Mzzzzzzzzzzzzzzzzz. Pelosi’s fantasy world. The world already knows she is a really sick psychopath, so there is little else we can say to describe her. Take a close look at these two morons, then quickly look at all of the twisted nose picking fantasy dwellers. who aren’t yet even dry behind the ears yet who think they know all the answers to all of America’s woes. Yes most of the SNOTNOSES, along with several LOW IQ ADULT politicians are advocating a SOCIALIST FORM OF GOVERNMENT JUST LIKE THAT IN VENEZUELA. They want everybody else to pay for their own FREE LIVING. They believe they are entitled to a life paid for by taxpayers. These people have been taught this all through their schooling from grade one forward. NOW THEY ARE GOING TO GET A HUGE MOUTHFUL OF REALITY. HOPEFULLY AT LEAST A FEW WILL SEE THE TRUTH OF REALITY AND CLEAN UP THEIR ACTS……….but I for one am not going to hold my breath as I wait. A very large number of Americans now think UP is DOWN, and they too have begun to believe in a fantasy world. Collectively it is IRRATIONAL HYSTERIA. …………..do I give a damn what the SNOTNOSES, or the low IQ MORONS try to accuse me of. I will tell them to go straight to HELL. Sadly there are far too few people left in America who feel as I do. Far TOO MANY AMERICANS are NOW AFRAID of the PLAYGROUND BULLIES. Americans have become so divided that they now try to stand alone against the PLAYGROUND BULLIES. They haven’t the intellectual capacity to realise that they must stand TOGETHER, and either verbally, or physically pound the hell out of the playground bully every time he tries to intimidate someone. He will soon back off from his BS, after he has been hospitalized a few times to reshape his BADLY BENT HEAD. Nothing better than Madcow tears. I’m surprised her eyes weren’t bleeding. Time to put her out to pasture with the rest of the bulls(hit). Best laugh of the day :). …………much of the air will be let out of ATOM SNIFFS tires when he discovers his so called CONCLUSIVE EVIDENCEAGAINST TRUMP has just evaporated into thin air. POOR LITTLE MARTY, now he will more than likely try to impeach Trump with/or without the approval of the rest of his gang of halfwits. When he fails he will then be ripe for prosecution himself. I doubt that president Trump would walk away from ordering the DOJ to file charges against MR SNIFF of attempted overthrow of a sitting POTUS. Mr. SNIFF could easily end up spending the rest of his maniacal life in a federal prison. Mr. Naddler could possibly follow close on SNIFF’S heels. Action from the religion of PEACE! The Islamic terrorists allegedly planned to use guns and a vehicle in a terrorist attack. That sounds like a combination Car Jihad and shooting spree. “So, to me, I say raise hell. Make people uncomfortable,” Rep. Omar said to the excited audience. “Because here’s the truth, for far too long we have lived with the discomfort of being a second-class citizen and frankly I am tired of it, and every single Muslim in this country should be tired of it. …………the raving political liberal lunatics have lost the battle, and the war.!!!! Yet they now say that their evidence re-enforces the New York state forthcoming investigation which they are planning to continue until Trump is OUT OF OFFICE. Now Trump can take his case to the SCOTUS. Mr. Naddler will LOSE his so called CRIMINAL PROSECUTION OF PRESIDENT TRUMP. Mr. Maddler could himself end up in prison for the rest of his pathetic little life. He along with POOR LITTLE MARTY SNIFF are like two dogs sitting and howling at the moon. …………..is clearly trying to instigate a Civil War. Her SICK TWISTED MIND, has already been demonstrated to the American people. She should be removed from Congress……..she is UNFIT to be in Congress. …………..WILL CONTINUE WITHOUT END. THE FANTASIES WILL MORE THAN LIKELY EVEN DEEPEN. THE LIBERALS ARE NOT GOING TO WALK AWAY FROM THEIR FANTASIES. THE LIBERAL LIES WILL ALSO CONTINUE. …………..Mzzzzzzzzzzzzzzzzz Omar is married to her radical Islamic beliefs. There is no place in our government for people who practice, and follow radical Islam.